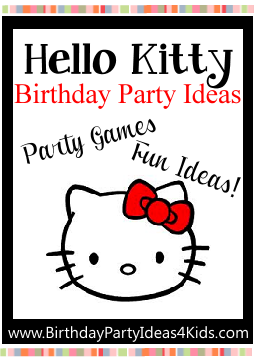 Hello Kitty birthday party ideas that will help make your Hello Kitty party a success. We've listed all the great ideas sent in by our readers and placed them on one page so you can mix and match the ideas that will work best for your party. Hello Kitty note cards with birthday party information printed inside. White note cards with black whiskers drawn on the front with a black permanent marker. Or glue black pieces of yarn on the front to look like whiskers. Make kitten paw prints by printing them on the computer or drawing them on white paper with a black marker. Cut them out and place them along the path to the party entrance ... or you can also draw paw prints on the sidewalk with sidewalk chalk. Tie red or pink bows onto tree branches or bushes outside the party area. On the front door make a large pink bow and attach it to the top of the door and then use black pipe cleaners to make Hello Kitty whiskers and attach them to the sides of the door. Use wide ribbon or strips of fabric (pink or red) and tie them in a bow on the back of all the party chairs. Tie a large bow around the edge of the party table or the table holding the cake and presents. Use white tablecloths and pink or red plates with black flatware. While guests are arriving to the birthday party use face paints or eyeliner to draw hello kitty whiskers on each guest. You could also paint black or pink triangles on their noses. Give guests a large pink or red hair bow (or bow on a headband). On white t-shirts let the kids paint on a Hello Kitty face with fabric paints or permanent markers. 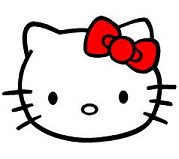 Have a large picture of Hello Kitty on the table so they can trace it or freehand. Let guests decorate pink or red bags (to hold the pinata candy) and then line them up to take a turn at a mouse Piñata. See safety tips and directions on setting up the Piñata on our Piñata Game page. You will need plastic mice or mice shapes cut from card stock and small prizes to give away to play this game. On each one of the mice write a number that matches the number that you have given one of the prizes. Each prize should have a different number. Hide the mice before the guests arrive. Ask guests to help you find all the hidden mice. You can give away the prizes the first time when they find the mice, or play several rounds and at the very end of the last round tell the kids what the numbers on the mice mean. Then they can exchange their mice for prizes. Teams race to see who can fill their container first with sand. You will need a very large container filled with sand, two smaller containers that the kids will fill up and some plastic spoons for this game. Place the large container filled with sand at the opposite end of the playing area then where the teams are lined up with their smaller containers. Each team gets a plastic spoon (have more available just in case they break) and on "go" must run to the large container, get a spoonful of sand and then run back to their teams container and place the sand inside it. First team to fill their container wins! See our girls party games page to find more fun party games! Place the bday party favors in one of these options.